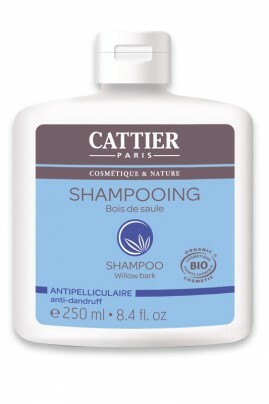 Cattier Organic Shampoo with Willow Bark Extract provides long-lasting relief from dandruff and prevents irritation, leaving the scalp deeply cleansed and soothed. Rich in Wheat protein composition, which is very similar to the keratin proteins in hair, it nourishes and strengthens the hair at its very roots, leaving it easier to comb out. Essential oils selected with the utmost care, have been added in CATTIER Organic Anti Dandruff Shampoo to enhance its cleansing properties and to leave the hair lightly fragranced. Sens bon et est efficace contre les pellicules, what else ? HOW TO GET RID OF DANDRUFFS ? Apply Cattier Organic Willow Bark Shampoo to wet hair and gently massage in, produce lather. Leave for a few moments, and then rinse thoroughly with warm water. Organic Aloe Vera, Willow Bark extract, Plant vinegar (Lavander, Rosemary, Sage, Thyme), Wheat proteins, Glycerin (vegetable), Essential oil of Sweet Mint, Orange blossom, Sweet Orange, Mandarin, Grapefruit and Lemon, Organic essential oil of Tea Tree (Melaleuca Alternifolia). Aqua, Ammonium Lauryl Sulfate, Sodium Cocoamphoacetate, Sodium Chloride, Glycerin, Aloe Barbadensis Leaf Extract*, Acetum (Vinegar), Lavandula Angustifolia Extract, Rosmarinus Officinalis Leaf Extract, Salvia Officinalis Leaf Extract, Thymus Vulgaris Extract, Hydrolyzed Wheat Protein, Phytic Acid, Hibiscus Sabdariffa Flower Extract, Salix Nigra Bark Extract, Lactic Acid, Benzyl Alcohol, Potassium Sorbate, Sodium Benzoate, Melaleuca Alternifolia Leaf Oil*, Parfum, Limonene.